Spray 5- to 6-quart slow cooker with cooking spray. Place 3 tortillas in slow cooker, tearing if needed to cover bottom. In medium bowl, beat eggs, milk and chile with whisk. 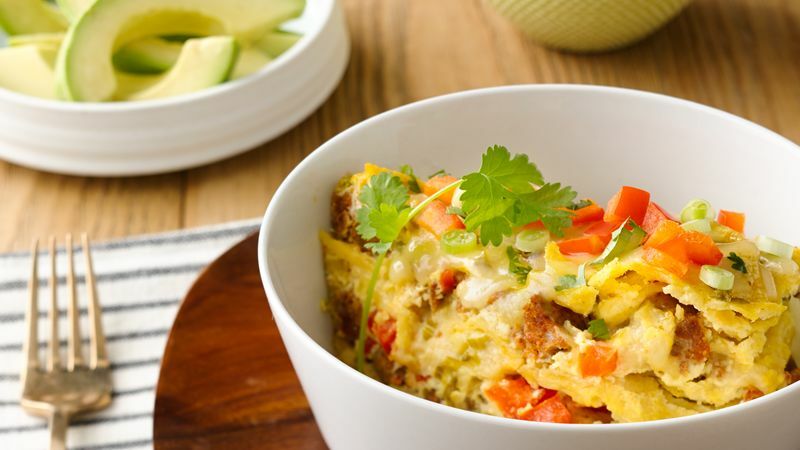 Reserve 2 tablespoons chopped bell pepper, 2 tablespoons green onions and 3/4 cup cheese; set aside. Top tortillas in slow cooker with half of the sausage, remaining bell pepper, green onions and cheese. Repeat layers. Top with remaining 3 tortillas, tearing if needed to cover mixture. Pour egg mixture over tortillas. Cover; cook on Low heat setting 4 to 5 hours or on High heat setting 2 to 3 hours or until temperature reaches 160°F and center is set. Sprinkle with reserved cheese, bell pepper, green onions and the cilantro. Remove foil before serving by loosening edges with table knife. Serve with salsa and avocado slices, if desired. For a make-ahead tip, you can cook the sausage, shred the cheese, chop the vegetables, and line your slow cooker with foil. Refrigerate ingredients until used. Slow cookers vary. An oval slow cooker works well for this recipe. Keep an eye on your slow cooker breakfast so it doesn't get overdone. The foil will help it from browning too quickly.